A Wall Street Journal analyst recently wrote that PV solar installations could result in the demise of the grid, with PV solar thrusting it into a “death spiral” caused by an ever increasing amount of electricity being generated by roof top PV solar installations. The presumption is that distributed generation of electricity could revolutionize how electricity is produced. If there is a death spiral, it will be the result of tax payer and customer dollars being used to subsidize PV solar installations. PV solar is uneconomic without subsidies, or what amount to subsidies. 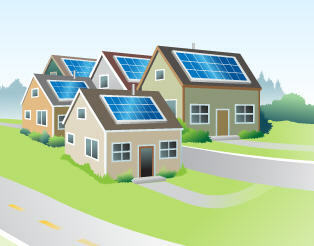 There are direct subsidies, such as tax credits for PV solar installations. There are indirect subsidies, the most insidious of which is net metering, where the owner of a PV solar installation is paid for the electricity he sells to the grid at the same rate he pays when buying electricity from the grid. Forty-four states have adopted net metering laws. There is an indirect subsidy in the form of renewable portfolio standards (RPS) requiring utilities to provide a percentage of electricity from renewable sources, i.e., solar or wind. RPS laws in 30 states require as much as 33% of electricity to come from renewables by 20251. The ultimate subsidy occurs when third-party leasing companies install PV solar on homes, and the home owner pays the leasing company a low fixed amount for the electricity he uses, while the leasing company sells excess electricity to the utility at net metering rates. In addition, the leasing company can take advantage of accelerated depreciation and all the other tax advantages and subsidies offered by the state and federal government. One writer refers to this array of subsidies as the “solar swindle”. Here’s a factual analysis of PV solar. Under the best of conditions, PV solar rooftop panels can produce 0.75 kWh of electricity per square yard of panel per day. A two-story, 3,000-square-foot home will have a total roof top area of approximately 1,500 square feet. But, since only half can face the sun, the available area is 750 sq ft.
With electricity costing 11 cents per kWh, this installation can save $6.88 every day the sun shines. If the sun shone 365 days every year in every city in America, there might be some small justification for these investments. However, the sun does not shine every day and this is one reason why the economics are bad. In Phoenix, Arizona, where the sun shines 211 days each year, an installation on a two-story, 3,000-sq.-ft. home would save $1,451. According to a Wired Magazine article, an installation now costs $20,000, where a few years ago it would have cost $45,000. The lower price is primarily due to the low cost of panels from China. While the future cost of panels may come down slightly, the cost of installation is not going to change very much. Dividing $20,000 by $1,451, we arrive at a payback period of nearly 14 years. This is a bad investment that only gets worse as we look at the results in other cities. In Atlanta, GA, the payback would be greater than 26 years. In Lincoln, NE, it would be 25 years. In Washington DC, it would be nearly 32 years. In Albany, NY, it’s greater than 42 years. The results for a ranch-style house with more roof area would, of course, be better. In many instances, PV panels might only last for 20 to 25 years, so homeowners might never recover their investment. Even with panels now costing half of what they did a few years ago, installing them makes no economic sense. The story for utility sized solar installations is similar. Utility sized PV or concentrating solar installations produce electricity at a cost of at least 22 cents per kWh versus 5 or 6 cents per kWh for electricity generated by natural gas or coal. This excludes transmission and distribution costs. This is something First Solar should comment on. These calculations do not include the added cost of providing back-up power during the day when the sun doesn’t shine or the added cost of constructing dedicated transmission lines used solely for bringing electricity from utility sized solar plants to where it can be used. Factually, distributed generation is a scam being fostered by subsidies that can lead to serious consequences for the grid. The grid is essential for providing electricity from traditional power plants since solar only generates electricity when the sun is shining, and there is no practical way to store electricity for use at night or on stormy days. There is no benefit to the country from undermining the grid or the utility business by forcing them into a “death spiral”, as postulated by the Wall Street Journal analyst. Distributed generation, as a concept, is destructive and undermines grid reliability2. Illinois 25%, California 33%, as examples. The use of back-up for hospitals etc., uninterruptable power and cogeneration are not part of the distributed generation concept. Some micro grids can make sense, but not as a part of distributed generation. Thanks for the comment. Examining the cost of PV solar in this manner shows exactly how inefficient it is. Donn: Great article but the public is not informed and politicians do not take the time to know that claims to save the world are built on falicies. Unfortunately you are right, Not enough people are becoming informed about so-called clean energy. The media merely perpetuates misinformation. I’m hoping my articles can get some people thinking seriously about the issues. I greatly appreciate your comments about my articles. What you say about being surrounded by misinformed people is true, yet we may still be able to reach enough people that policies can be changed. Reaching more people is a huge problem, something I continue to address every week. It’s why I have a Facebook page for Power For USA, and Tweet when I publish a new article. I continue to be hopeful that those who read my articles will forward them to their friends, with a suggestion that they sign-up to get the articles delivered to their mailbox. Any suggestions on how to improve readership would be appreciated. It appears that the topic of The Politics of RE is getting a lot of play currently. It’s amazing what happens to a process when your real goals for actions are hidden. Unfortunately, when a decision maker doesn’t worry about the effectiveness of the solutions proposed it leads to long term cost allocation problems that can be rather politically destabilizing. Thanks for the comment. Azmat gives away the game. All he, and others like him want, is for the rest of us to use less energy and lower our standard of living. This is a biased account of rooftop PV, largely ignoring a critical detail in the net metering ‘issue’. I’ll use myself as an example, but it is applicable to many areas of the country. In my area of the country, the suns shines during the day. Hourly electricity rates, $/kWh, are higher during the day. In the midwest we’re anywhere from $0.08-0.20/kWh depending on load and hour during daytime hours and overnight rates go as low as $0.02/kWh. If I had rooftop PV, my utility simply nets out kWh for my billing period, disregarding the real time value of when I produced vs when I consumed. PV is not a panacea, but ignoring the fact that the sun shines when the grid and generating capacity is most stressed ignores the clean, peak shaving ability of PV. There is a lot of value in that. You may think facts are biased, but they are stubborn things. Everything in my article is factually correct. You are correct when you say solar provides peaking power, but it’s at a high cost. The utility nets out the power used and the power generated, and then pays the PV solar system owner, say 11 cents per kWh in Illinois, for the power sent to the grid. It is not specific enough to say that PV solar proves “peaking power.” The first two to four percent energy market penetration may address a reasonable percentage of gross load peaks, but as PV solar addresses those, the daily peaks soon shift to evening hours. In CAISO today, for instance, marginal PV solar capacity has near zero ability to reduce the need to build/maintain the dispatchable fleet while maintaining current reserve margin levels. Much of this effect is because September is essentially a peak load month but days are growing much shorter at that time.